Montblanc presents its Homage to Nicolas Rieussec II model, designed to commemorate the second invention presented in 1825 by Nicolas Rieussec, the inventor of the first inking chronograph patented in 1821. This instrument featured a process for marking the duration of time periods through the tip of a direct-drive seconds hand loaded with ink. Issued in a limited edition of 565 timepieces, the 43 mm-diameter Montblanc Homage to Nicolas Rieussec II watch in steel is highlighting its ties with the first 1825 hand-equipped chronograph, this new model emphasises Nicolas Rieussec’s constant insistence on the need to achieve greater accuracy. The seminal influence of the virtuoso watchmaker Nicolas Rieussec is widely acknowledged today. He created the first timepiece capable of inscribing the duration of a time-period onto two rotating enamelled discs in 1821. Its method of operation was later patented with the French Academy of Science in 1822 under the name of “chronograph”. This mechanical marvel was literally designed to write the time, as indicated by the Greek roots from which this new term was coined (i.e. chronos, meaning “time”, and the verb graphein meaning “to write”). Its time measurement function was activated by two enamelled discs inscribed with time graduations. It was on these discs that a fixed hand in the form of the tip of a split quill recorded the time by depositing a drop of ink on their surfaces, activated by a slight vertical movement provoked by the user. The etymology of this timepiece’s name recalls Montblanc’s own roots as a Maison with an international reputation for the manufacturing of writing instruments. Since 2008, therefore, this device for “writing time” has inspired Montblanc’s watchmakers to create a collection of chronographs powered by a Manufacture calibre combining modernity and tradition. This highly efficient watch movement employs a way of reading time measurements on the dial that is derived from the first timing instrument perfected by Nicolas Rieussec. However, this visionary watchmaker constantly continued to reflect on the most accurate way to record timing information. He never ceased to innovate, and in 1825 he developed an improved version of his newly christened chronograph. With this model, he abandoned the use of a rotating graduated enameled disc in favor of a long, slender central seconds hand (christened the Diablotine or “little devil”) which would rotate to follow a minute-circle displayed around the dial. The tip of this hand, loaded with a drop of ink, was made up of an ingenious mechanism to enable users of the device to deposit a tiny portion of this ink wherever they wished on the surface. Operating in the same way as a calligraphic pen, his new device made this visionary watchmaker the acknowledged master of the recording of even very short time periods since it guaranteed its users an accuracy in the measurement of the duration of performances that had never been achieved before, of the order of 1/5 of a second. In 2015, Montblanc now pays fresh tribute to this great watchmaker by unveiling a new interpretation of his 1825 inking chronograph. In its colours and the shape of its hands, the Montblanc Homage to Nicolas Rieussec II chronograph faithfully reproduces the appearance of the original, while at the same time adapting to the modern era by using the most advanced materials and methods. The new Homage to Nicolas Rieussec II chronograph in the Montblanc Nicolas Rieussec collection displays the date, a second time zone indication and a day/night indication. This steel timepiece will be launched in a limited edition of 565. In order to ensure the accuracy of the measurements of short time periods while remaining faithful to the method of indication used in the second chronograph perfected by Nicolas Rieussec in 1825, the rotating counters indicating the seconds and the recording of 30-minute time periods, hitherto located respectively on the left and right of the dial in all models, are now for the first time replaced by slender chronograph hands. These will not, of course, deposit a drop of ink on the counters, but will be stopped in position by pressing the push-piece situated at 8 o’clock. The corresponding lever acts on the column-wheel, which in turn transmits the order via a vertical clutch to the wheels that carry, at the ends of the pivots, the hands pointing towards a railtrack circle with numerals resembling those appearing on the dial of the original chronograph. In addition, the chronograph seconds hand situated on the left includes a counterpoise inspired by that found on the long hand of the original 1825 timepiece. 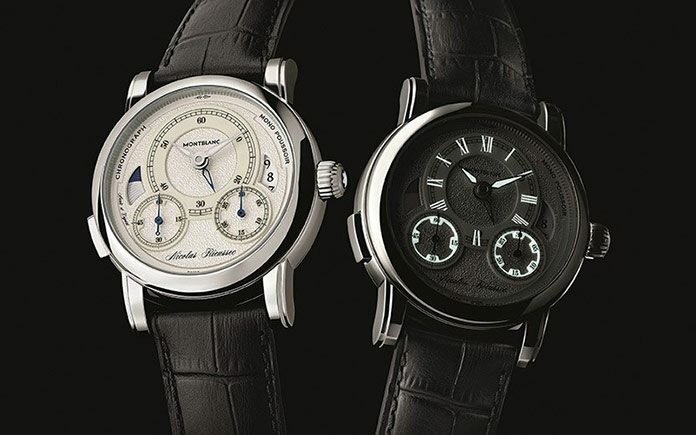 In terms of the indications, for the hour ring and the graduation of the counters, Montblanc has opted, as in the case of the Homage to Nicolas Rieussec I chronograph, for an ultra-modern hybrid ceramic with the exclusive Montblanc Mysterious Super-LumiNova®, the clarity and brilliance of which is reminiscent of the enamel used in traditional dials. In daylight it displays a railtrack minute-circle similar to that found on the watches of the period, but in the dark its full potential is revealed. In fact this ceramic incorporates pigments of Super-LumiNova® to trace out Roman numerals in a typographic style identical to that employed by Nicolas Rieussec for his 1825 chronograph. This mysterious display technique contributes an added element of magic that reinforces the impact of the dial with its surface displaying a grained appearance. This is inspired by the treatment used for the metal parts of the original timepiece and highlights the apertures with a delicate satin-finished background displaying the date at 3 o’clock and a delicate guilloché pattern displaying the day/night indication at 9 o’clock. A second time-zone indication is displayed by means of a skeleton hours hand. The innovative dial conceals the self-winding MB R200 Manufacture calibre. This combines traditional watchmaking craftsmanship with the most advanced technical research. A meticulously milled column-wheel links the movement’s gear-train to the monopusher chronograph mechanism through the mediation of a vertical clutch that operates with practically no friction and prevents any undesired jumping action of the seconds hand when the chronograph function is activated. The double barrel ensures a 72-hour power reserve. However, this mechanism is noteworthy not only for its technical performance, but also for the qualities of its design in terms of watchmaking aesthetics. Its finishes, such as bevelling and the use of the Côtes de Genève motif, and the presence of blued screws in the traditional style and an aligned gear-train, all contribute to concentrating attention on the balance-wheel, which exerts an almost hypnotic fascination with its 28,800 vibrations per hour. This perfectly balanced movement is produced and assembled in the Montblanc workshops in Villeret. The automatic calibre visible through the timepiece’s transparent case back is protected from external impacts by a steel case with a diameter of 43 mm. Produced to the very highest standards of quality, this traditional timepiece with contemporary dimensions features a curved profile specially conceived to make it a superbly comfortable fit for any wearer’s wrist. Water-resistant to 3 bar, the Montblanc Homage to Nicolas Rieussec II model features on the dial side a slightly domed sapphire glass designed to fit perfectly with the curvature of the bezel, and on the back a flat sapphire glass that allows for detailed observation of the finishes of an automatic movement that includes 319 component parts, each meticulously crafted. This monopusher chronograph, produced in a limited edition of 565 pieces, is worn on a black alligator-skin strap with a triple folding buckle. The Montblanc Homage to Nicolas Rieussec II model is delivered with a certificate guaranteeing that its high level of performance has been tested for 500 hours by the Montblanc Laboratory Test 500.